I think if some of us had our way, we’d crochet every second of every day. Okay, maybe we wouldn’t crochet THAT much, but I have a feeling we would still love to have all the time in the world to do what we love. That’s why I’ve pulled together my favorite free crochet round ripple patterns. Have you ever tried one? Without further ado, here are 12 round ripple afghans that will have you crocheting ’round the clock! Have you crocheted a round ripple afghan? Have you tried any of these patterns? BONUS! 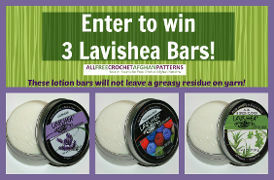 Enter to win 3 Lavishea Lotion Bars! The deadline to enter is November 13th, 2013 at 11:59:59 p.m. Eastern Time. As crocheters, we often struggle with keeping our hands moisturized without getting any lotion on our crochet projects. In the winter, this is especially difficult. Take care of your hands with the Lavishea Lotion Bars. Enter to win today! I crocheted a spider man round ripple afghan. Even though it was repetitious and got a little boring at times, all that melted away once I saw the smile and excitement on the little boy’s face who received it as a birthday gift. I’ve crocheted many a ripple over the last 43 years but never one in the round. Just finished my last project, maybe it’s time to try one.